Any self-respecting playoff team should be able to count a home game against the Jaguars as an easy win, but today the Houston Texans suffered a comprehensive 29-7 defeat to Blake Bortles and his traditional punching bags. The one bright spot for the Texans was the opening drive of the second half. 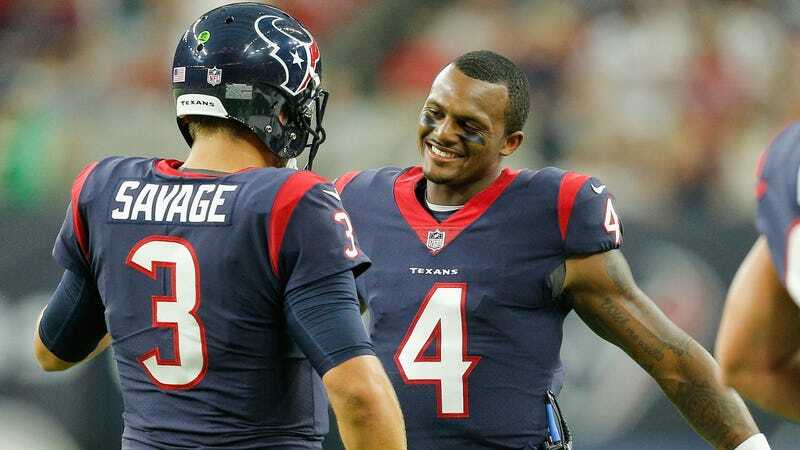 Rookie Deshaun Watson took over for starting QB Tom Savage after his horrendous start. The Clemson product led the team down the field and did what Savage has never done in his career: throw a touchdown pass. The joy was short-lived, as even that Watson drive took some luck (an interception was called back), and he was never able to recreate what he did in his first few plays. It didn’t help that the Texans lost three receivers—TEs Ryan Griffin and C.J. Fiedorowicz, along with WR Bruce Ellington—to concussions. However, Watson was a clear improvement over Savage, who was practically immobile in the pocket and barely looked worthy of being on an NFL roster, let alone starting for a supposedly good team. The Texans should do two things this week: Bench Savage forever and pay Brown.